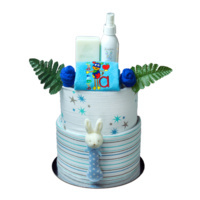 Celebrate the new arrival with our beautiful signature gift, the Nappy Cake. 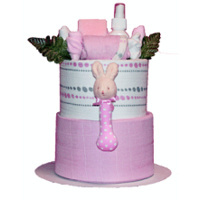 Our creatively built Nappy Cake gift hampers are shaped to resemble a tiered cake (although completely inedible). 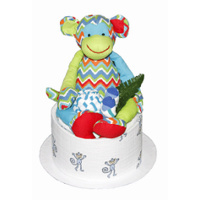 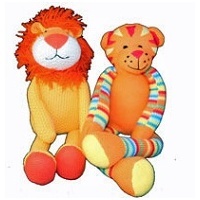 They are 100% useable and are a memorable and practical gift for new parents. 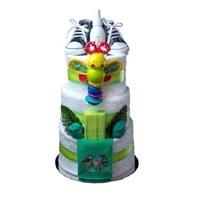 We use only quality products to make up our nappy cakes, these include disposable nappies, muslin wraps, nursery mist, socks singlets, rattles, bibs etc. 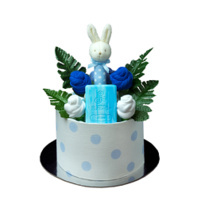 Browse around our store and you will find Nappy Cakes in traditional pastel blues & pinks, we also have a range of beautiful bright nappy cakes inspired by the gorgeous colourful toys they feature, you will also find gift bags, boxes and baskets. 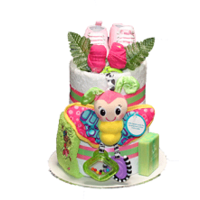 We accept direct deposit, Visa, MasterCard and American Express.